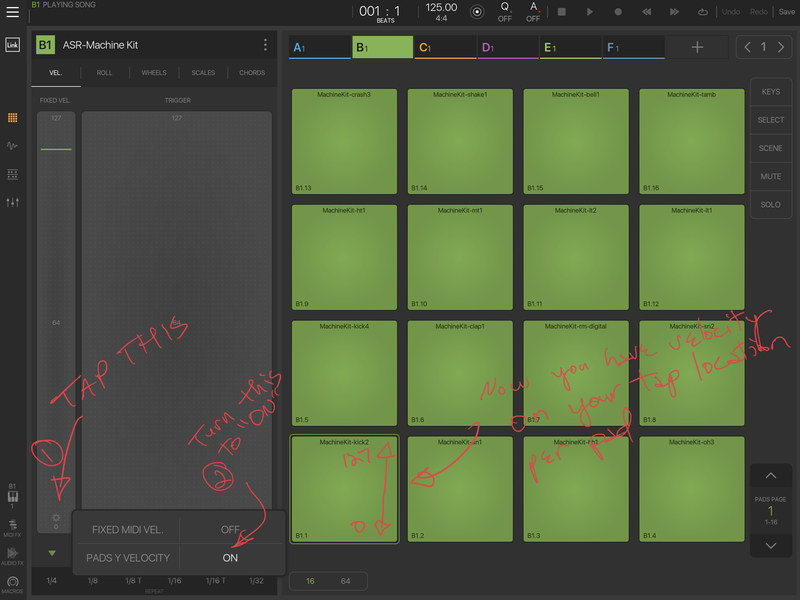 This request is mostly to do with layouts - everything already exists in the app, so really it's about having more options so that finger drumming is more viable. So first of all I really enjoy creating beats in NS2, the way the live MIDI recording and the timeline both work makes it really easy to create varied and flowing beats - that's awesome. 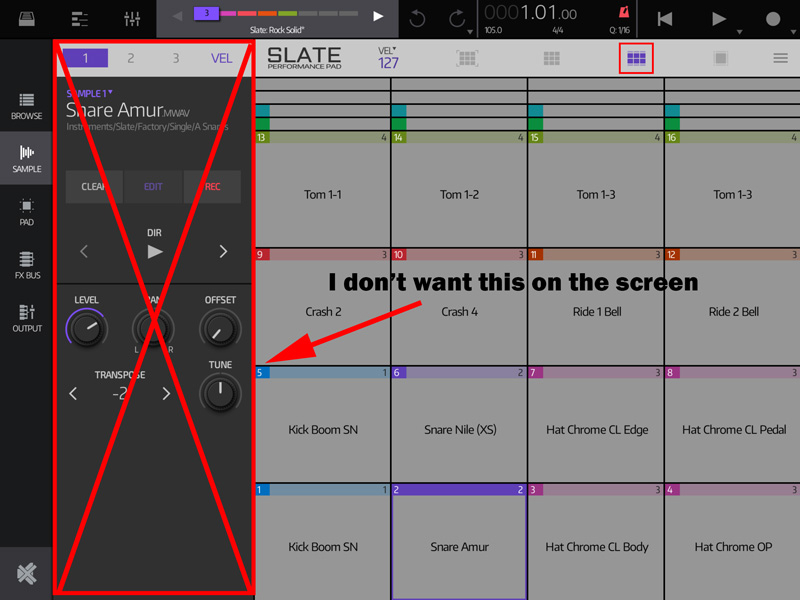 But to really have a natural feel (with varying velocities) I have to use my Akai MPD 226 controller, because the Slate pads don't have any velocity variation unless you are in single pad view. So firstly the layout: it's so close, but just not quite there. I want a full screen of square pads, but I can only have one or the other, not both together. 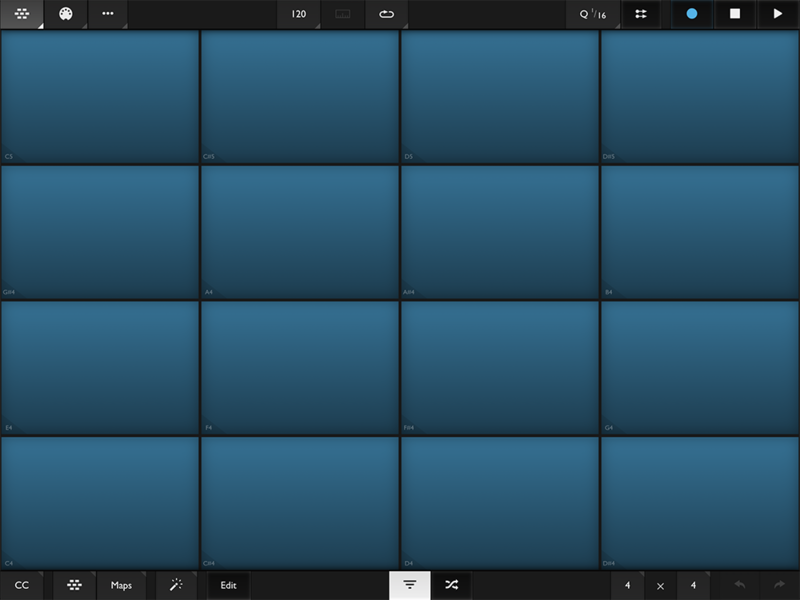 The ideal layout here would be 16 pads in full screen (without that row of super-thin pads at the top). Which brings me to the second issue: in single pad mode you can control velocity by how high up the pad you tap, which is great. 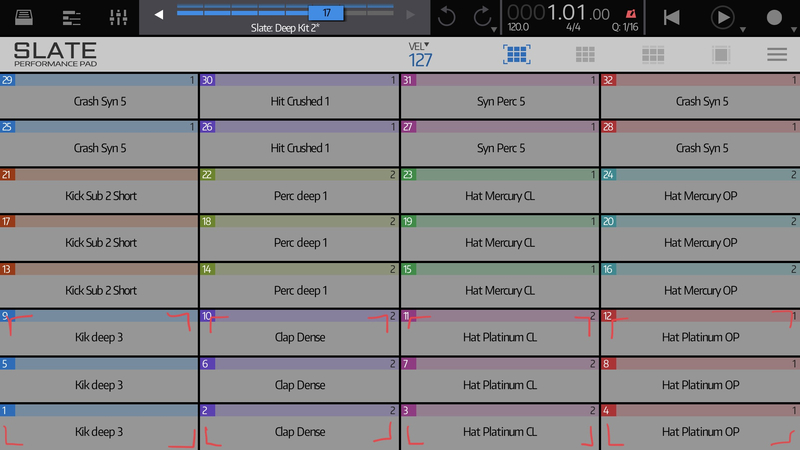 But it only works in single-pad mode, so it's only useful for hi-hats. For kick and snare the way the screen slides around between pads is just too distracting for me. I think with 16 pads in full screen mode the pads would be big enough to support velocity in a similar fashion to single pad mode (obviously with less control but it should be good enough). So to summarise: with 16 velocity capable pads in full-screen mode NS2 would be really great for live finger drumming. The current layouts just don't quite do it IMO. Use Copy/Paste to rearrange kits or start from scratch and create kits wherein you devote 3 rectangles to the same sound. Deep Kick 3 on pads 1, 5, & 9 now makes up more of a square on the screen. Adjust the velocity of 1, 5, & 9 to your liking and voila! Custom big square velocity sensitive Slate kit for you! Sure, requires a bit of set up, but once it’s done, you can call it up anytime. Realistically you won’t need to do this for every pad/sound because you won’t probably play all 32 sounds. If so, then break it up into two kits. I'm with Richard here... I'd much rather have a Y-Axis-base velocity on the "pad" itself. I get this capability from the 1"-square drum pads on my hardware keyboards; it can be done in a small space. BM3 is hands down the best finger drumming setup in IOS. I finger drum all the time. Like my iPad is up on my desk while I work and I finger drum while I’m thinking through stuff. BM3’s layout is exceptional. This simple tweak could do exactly what @richardyot is talking about. good ideas... vertical velocity sensitivity in 16 pads view, althought it would be not super accurate, would be nice addition... I would like it and use it a lot ! I think I posted this before but my old Yamaha RX5 drum machine had a cool function where you could assign a certain parameter to the top row of pads. So the pads could be different pitches or different levels or different lengths I think. You could go through as a sequence was running and play in for instance high hats at different levels and then switch the parameter over to pitch and play them in at different pitches. You could set it so that the range of pitches or the range of levels was tight so there was just a little bit a difference between pads or it could be very broad as much as I think plus or minus a couple of octaves from the beginning pad to the end pad.And it would retain the levels and the pitch. Really nice way to get dynamic results. Plus it had a reverse button where you could tap reverse while the sequence was playing and hit a pad and that particular step would pay play back in reverse but none of the others would. 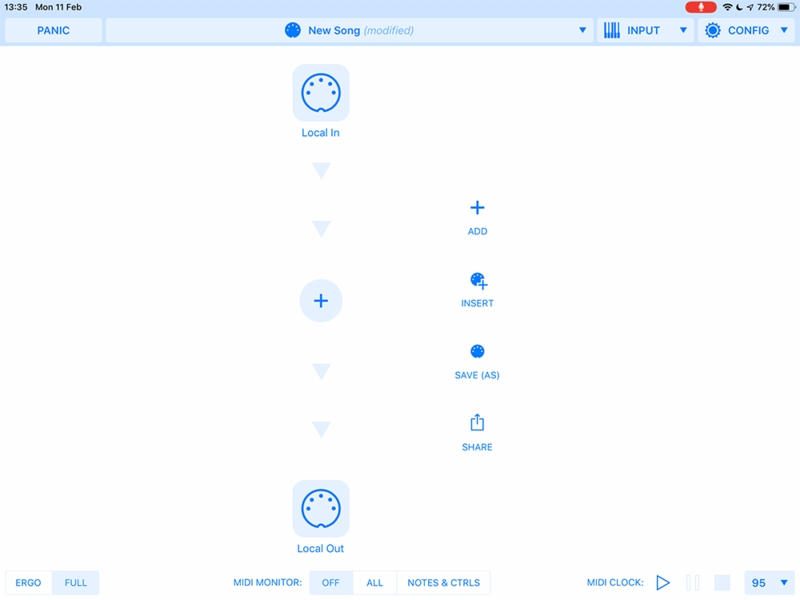 There was also a damp button where if you had a long ringing sound like a crash cymbal you could turn on the mute function and hit a pad and mute the symbol sooner than its natural decay. Pretty cool stuff overall. Just some ideas for a potential inclusion into Slate. OK so I've found a workaround which I thought might be worth sharing. 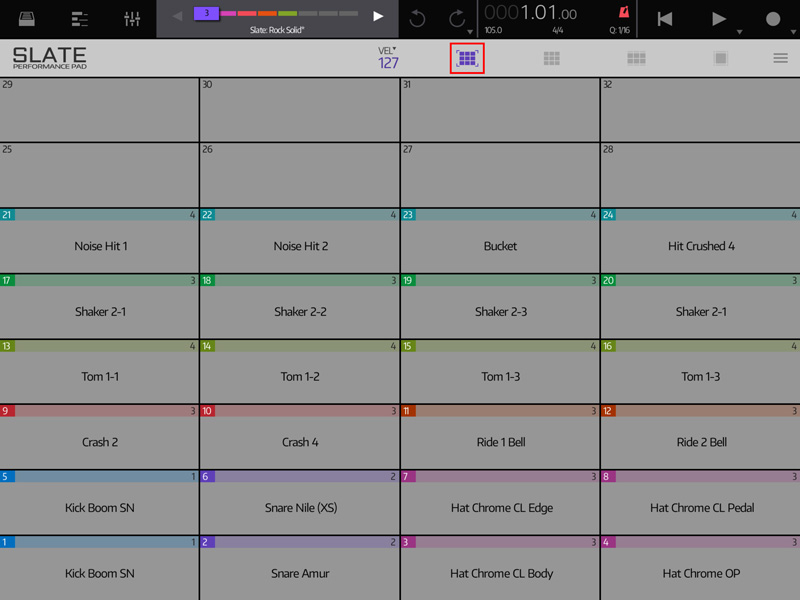 I used Xequence which allows you to set a custom drum grid with any number of rows and columns, and can map velocity in 3 different ways: vertically, horizontally, and out from the centre. I also tried to use ChordPolyPad to do something similar, but to my surprise CPP doesn't support vertical velocity output on its pads. Anyway it would still be awesome if this was possible directly in NS2 one day. I agree. The one pad velocity is great, if it could be expanded to more pads I would go from liking (it's quite nice) to loving slate.